My first visit in New York was, naturally, to the shoe store Leffot. When I was in New York four years ago, I stumbled across Steven Taffel’s new shop the month it opened. At that point you couldn’t get half the brands that he stocked – Corthay, Aubercy and some US producers – in London. I scraped together my pennies (or rather my credit cards) and bought a pair of Corthay Wilfrids – the same ones seen here in a recent post on the new Corthay shop in London. Steven was a breath of fresh air back in 2008, and he remains unique. The brand range is strong and the service personal. Some brands such as Edward Green are sold in other department stores. Church’s has its own store in Manhattan. But people come to Steven for the service. During the couple of hours I was there, it seemed like every other person who walked through the door was a friend, greeted by his first name. Steven’s hardest job – explaining to New Yorkers why they should pay more than $1000 for a pair of shoes – appears to have been done. I also popped in during the semi-annual Edward Green trunk show (above and below). There were some styles on display that I had never seen in London. A lot of them were samples or destined for guys who had ordered particular models. 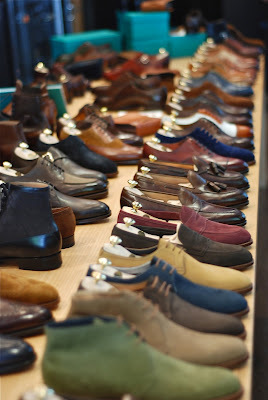 During the trunk show they often sell 30 to 40 pairs. This is a model that many other stores should emulate. Particularly in London, which has a real dearth of menswear boutiques, stocking a range of sartorial brands. Trunk shows are a way to make these stores into destinations: more personal than a department store and far more satisfying than buying online. And there are plenty of visiting tailors and shoemakers that would gladly be there rather than in a hotel room. From Ralph Lauren to Attolini to the Miller brothers, everyone knew Steven and referred to the store unprompted. Two separate customers referred to buying shoes there as “like buying crack”. It’s great to see such a great shop doing so well. You can follow the discussion on Leffot shoes: New York is hooked by entering your email address in the box below. You will then receive an email every time a new comment is added. These will also contain a link to a page where you can stop the alerts, and remove all of your related data from the site. Definitely hats off to Steven. What’s the closest thing to Leffot in London Simon? Being a New Yorker, and living near Steven’s shop, it has been a nice addition to the neighborhood. What took a while to get used to, was the fact that his business is primarily trunk show driven, as his stock seems to be limited and sell quickly. At least that’s my impression from having him tell me he doesn’t have my size in anything I’ve ever wanted. He is a nice fellow, and the offerings are terrific. There’s nothing in London. Corthay and Edward Green have their own stores, but the department stores are terrible, all save Liberty being run by Kurt Geiger. How viable do you think a shop like this (with a niche product, and largely driven by trunk shows) would be in London? With C&J, Edward Green, etc. (or Cleverley if you want higher end bespoke) and all of the shirtmakers and tailors, I think it would be a tough sell. There might be an angle if you can identify something that isn’t readily available in London, but I think it would have a be a very narrow niche and I doubt it would be enough to sustain a shop. Italian clothing might have been a possible angle before Rubinacci and Marinella opened in London. There might also be scope for a few visiting tailors – maybe French or Italian, or the HK tailors offering a value proposition in London. 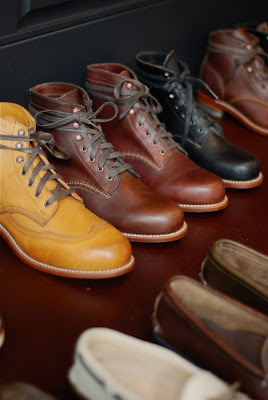 The other approach would be well made American products (Alden shoes, Filson bags, etc) but a few businesses have already sprung up doing that already. Maybe I’m overly pessimistic, but it feels like more of a hobby than a real business plan. I think there’s still some potential for a good shop in London. Lots and lots of brands aren’t stocked here, such as Aubercy, Carmina, St Crispin’s, Stefano Bemer, plus the Americans as you say. There are dozens of other Italians and French makers, not even taking into account the bespoke makers who could come for trunk shows. Plus, any small shop would have no problem competing with a department store on service etc, so they could stock some of those brands. Simon, do you think location would be key or play a huge part in the success or failure of such a niche shop? No, not really. London has so many centres anyway, from High St Ken to Mayfair, Oxford St, City/Canary Wharf. And Trunk is in Marylebone. The understated atmosphere makes the artisanal aspect of the shoes really stand out. Steven has great attention to detail and is very knowledgable and patient. As great as the experience is, I rather order from him online.